Muskan: Madam ji, does your husband allow you to drive? Me: Why does he need to allow me to drive? I drive because I have to. Muskan: Who taught you to drive? Muskan: So, she also knows how to drive and drives a big motor car? Muskan: Girls do not drive madam ji. It is not good for them. Muskan: Madam ji, girls are not good with these things and they might have an accident. They may die and kill others also. Me: Are you scared sitting with me when I drive? Muskan: (after thinking a bit) No, I am not but then you are not from here so you can do it. Muskan: No one really (this also took some thinking) but isn’t it true? I don’t see any girls driving around here except you and everyone knows that girls can only become teachers when they grow up. It’s even there in my book. Me: Really? What happens if they can’t become teachers for some reason? Muskan: Oh, then it is easy. They can get married and cook at home. The conversation was cut short as we had reached Muskan’s home but it got me thinking about stereotypes and biases in the books that most children in our rural setup have access to. To be honest, the only books they have access to are their textbooks. 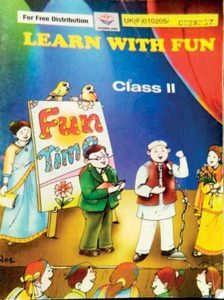 If you take Uttarakhand’s textbooks for classes 2 and 3, at first you will indeed not find anything too obviously amiss. However, take a closer look and you will see what Muskan was talking about. There are pictures of women as mothers, grandmothers, and inevitably as teachers. In some chapters, other professions have been depicted but the illustrations are only of men. The farmer is a man, the soldier is a man, the cobbler, doctor and tailor are all men. In the class IV textbook, there is a picture of a lady in the post office but the picture is so obviously not from around here. The post office is too plush and the lady clerk has a short haircut and looks very different from any other lady Muskan might have seen. The depiction of women as homemakers on the other hand is strongly shown. There is nothing wrong in that really. However, if women are only shown in particular roles, this will and does perpetuate the gender stereotype which is so common in our social setup. 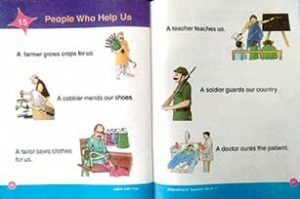 I am not saying that women have to be depicted as super women but isn’t it high time that textbooks, which are the primary source of printed information for most government school children, became more sensitive to issues related to stereotypes and biases? Another important example of individual stereotyping that comes to mind is when a teacher shared an example from his classroom. As was his habit, the teacher was always giving examples of ‘Ram and Sita’ going to school or doing various other things. One of his students, Reshma, asked him one day, ‘Why does Rehman not go to school ever, guru ji?” The said teacher was sensitive enough to understand his mistake and has consciously tried to be more inclusive in his class. The point to be noted is that in class 1 to 5 of the Uttarakhand books, there is no mention of names other than from one religion. This does not seem to be very inclusive and might give wrong signals to the children as well. Biases have a habit of creeping into all aspects of our lives. The explicit ones can be recognized and also dealt with but the implicit ones are very hard to pin point and even harder to neutralize and deal with. Rudrasheesh Dutta (Assistant Professor of English, Ranigunj University, West Bengal) has beautifully explained the subtle ways in which stereotypes and biases could be present in a textbook*. Neglect and invisibility: This can be commonly detected in textbooks where women and religious or cultural minorities have little presence in the selected prose or poetry pieces. Stereotyping: This involves assigning traditional and rigid roles to certain sections of the society or individuals, thereby making them unable to function as members in different roles in the society. Selectivity: Since individual literary works may not have the scope to infuse deliberate socio-cultural universality in their plot unless the author deems it necessary, it often makes random selections of prose or poetry pieces for ELT textbooks a hazardous exercise. Unreality: In many cases, our textbooks produce extracts from works which are written from specific viewpoints in contexts that are different from the target student group. Students may tend to take whatever they read as true or real and invalidate their own real life experience. Biases and stereotypes in textbooks are even more dangerous because they have access to the very generation which will be responsible for either breaking biases or carrying them forward in society. The aim of education in our policy papers is to help create citizens who have the ability to critically analyze ideas and information and apply them in the best possible manner for the good of the majority. The textbook is but one tool assigned to do this job but what happens when that tool is not the best? How is it to be used by the teachers to do what it is supposed to do? How does the teacher develop a critical eye to comb through the textbooks to catch and neutralize biases which are more usually than not, very present? Let us now talk of the ways in which a teacher could possibly neutralize the biases she/he encounters in textbooks. Firstly one must be on the lookout for biases and understand that the stereotypes and biases we may encounter are a reflection of us as individuals and the society that is made up of us. Secondly, we must be very careful in reading between the lines and beyond to understand the kind of language the textbook is using. Language plays an important role in perpetuating biases and teachers need to recognize this. In case of the gender bias present in textbooks, a teacher may neutralize it by showing pictures of various women professionals and telling students stories of women doing very well for themselves as scientists, sports persons, doctors, entrepreneurs, etc. In case of exclusion in the textbooks, the teacher may deliberately include stories, movies, etc., to be more inclusive. Teachers can use the multimedia to counteract biases by using relevant movie clips. For instance, showing children a short documentary on Bachendri Pal will definitely have a motivating effect. Lessons should be discussed in the classroom. In case of a stereotypical depiction of women, a discussion around the chores that they see women doing in and outside the house could alleviate the impression that these chores are not important. This will also encourage peer learning. If the teacher comes across a lesson with a bias, the lesson then needs to be dealt with in a way that all aspects of the lesson are discussed with the children. It is important for the teacher to develop critical thinking to be able to spot biases in textbooks and to be able to deal with them effectively. Unless the teacher has the critical eye to detect the bias, the textbooks will merely act as another tool for perpetuating the very same biases and stereotypes that hamper the holistic growth of our society. *Overcoming Bias in ELT Text: A Study in the Indian Context, Language and Language Teaching, Vol.1, No. 2, July 2012.